If you want to edit and create videos on your iPad, consider using the Pinnacle Studio for iPad app. It may seem expensive for an iPad app at $10, but my formative experiences with it this weekend were VERY positive. IMHO it’s worth the money. While iMovie for iPad is half the price ($5), Pinnacle Studio offers better options for integrating still images as “B-roll” video on top of audio originally recorded AS video or “plain” digital audio. It also supports multiple audio tracks (up to three total) from different sources, and adding a wider range of transitions as well as text titling/captioning options than iMovie. I love using iMovie for iPad for “Quick Edit Videos,” but strongly recommend Pinnacle Studio for true “digital storytelling” on the iPad. I’ll be leading a two day iPad-based digital storytelling workshop for Storychasers in about a month on December 7-8, and had been planning (along with our other Storychaser workshop curriculum writers) on using iMovie for iPad for project videos. My thoughts about which app we should use for the workshop have CHANGED based on my videography experiments using Pinnacle Studio on Saturday, however, and I’m hoping we’ll use it instead of iMovie. Pinnacle Studio for iPad offers more control and editing options than iMovie for iPad, and should definitely be considered if you’re wanting to create digital stories on an iOS tablet. Before I explain some of the features and reasons I’m loving Pinnacle Studio for iPad-based video editing, I need to mention that the app was previously called “Avid Studio for iPad” prior to September 2012. If you see references for Avid Studio or find tutorials for it, understand it’s the same app but is now Pinnacle Studio. It’s also important to know the same company (Pinnacle Systems) makes a “family” of Windows-only video editing software by the same name. If you’re a Windows user you can export projects you start with Pinnacle Studio for iPad and edit them further with the desktop version. This isn’t an option for Mac laptop or desktop computer users, but in my view that shouldn’t deter Mac users from giving Pinnacle Studio for iPad a try. Many thanks to Bill Rogers who enthusiastically recommended Pinnacle Studio for iPad to me last week when we met in Portsmouth, New Hampshire, thanks to Bob Sprankle. The screenshot below shows the main editing layout in Pinnacle Studio. If you remember “the good ‘ole days” of editing video on a Mac with iMovie ’06 and older versions, you’ll feel right at home with Pinnacle Studio. 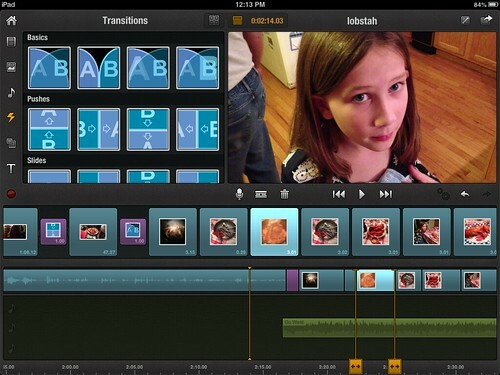 It’s similar to iMovie for iPad, but unlike iMovie you can import and use MULTIPLE audio tracks. You can also add images as “B-roll” video over video clips, which is something that’s not possible in the current version of iMovie for iPad. I found the razor blade tool for “cutting” video clips in Pinnacle Studio to be VERY intuitive. I also like the “storyboard” menu which is sandwiched between the media source menu (upper left corner) and the preview window (upper right corner), and the “timeline” at the bottom of the screen. When you click the HELP button on the initial Pinnacle Studio home screen, a 52 page tutorial help guide is displayed which is VERY thorough. After scanning through that document, I had all the knowledge I needed to create some iPad edited videos which included still images, video clips, montage image intros, text titles, and video transitions. 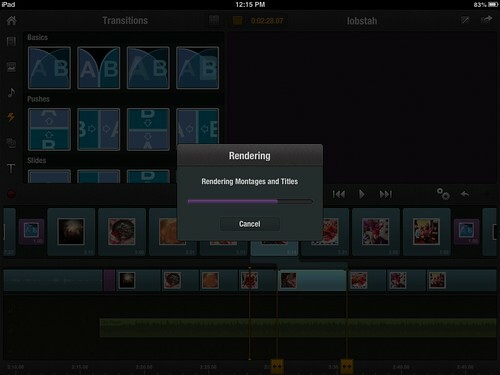 As you work in Pinnacle Studio for iPad, some of the video effects you build will require rendering. You can postpone this process if desired, but I found it worked great to “render as I went.” The process was quick on my iPad2, and I just tapped the ‘gears’ icon to start the rendering process when the app indicated it was required. If you don’t render, preview playback is a bit jerky but still viewable/workable. After I finished editing my videos, I opted to export them in high definition (1080p) instead of uploading directly to YouTube. A direct upload was an option, but since I was “out and about” on Saturday with access to lower speed Internet connections, I opted to transfer the videos (using Image Capture on my Mac) to my laptop and upload them on my home cable modem later. While I usually upload “quick edit” videos with iMovie for iPad using standard resolution, for these videos I decided I’d try sharing the high def versions. I shot these videos originally on my iPhone5, and transferred them using PhotoSync to my iPad. (This requires a wifi hotspot with open ports, most home wifi networks should be fine, but many hotel/organizational hotspots may be locked down and prevent media transfers with PhotoSync.) I edited and saved two videos on our flight from Boston back to DFW on Saturday, “Ferry to Peaks Island, Maine” and “Cooking Lobster in Maine.” The second video (about “Lobstah”) has the most effects from Pinnacle Studio which are not possible with the current version of iMovie for iPad. In the next couple months, I’ll be updating the media product pages on my “Mapping Media to the Common Core / Curriculum” website for both “Quick Edit Videos” and “Digital Storytelling.” Lessons from my December Storychasers workshop on iPad Digital Storytelling will make there way into those links and tutorials, I’m sure. Have you tried using Pinnacle Studio for iPad lately? If so, what were your impressions and experiences?